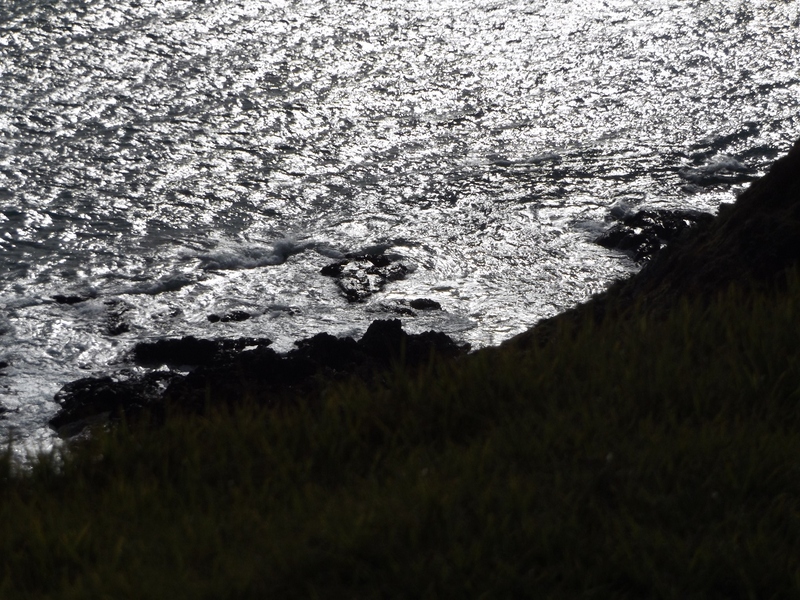 This entry was posted in Uncategorized and tagged beach, cliffs, light, photography, Porirua, sea, Whitireia Park on July 29, 2015 by ordinarygood. 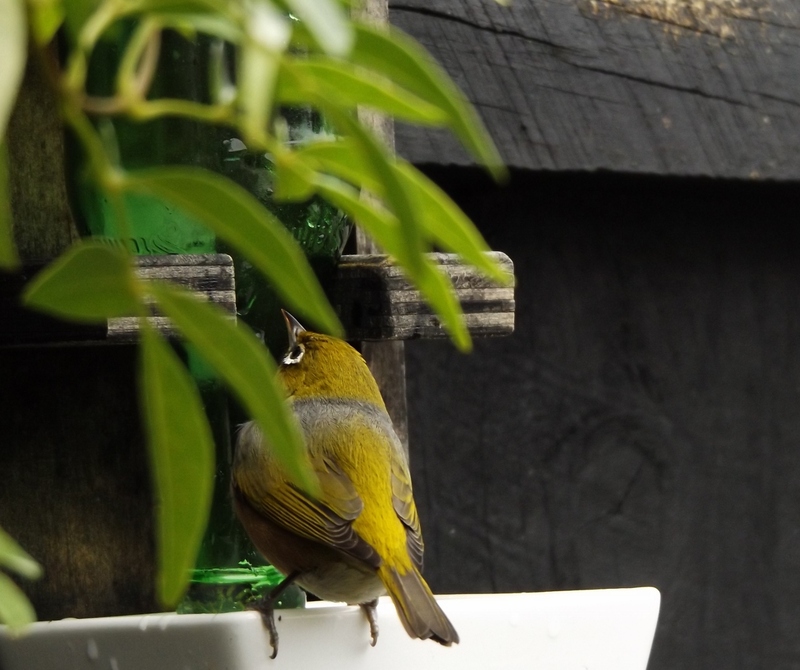 This Tauhou or Silver eye/Wax eye was happy enough for me to get quite close to it on the sugar water feeder today. This entry was posted in Uncategorized and tagged birds, gardens, nature, photography, silver eye, sugar water feeder, Tauhou, wax eye on July 27, 2015 by ordinarygood. 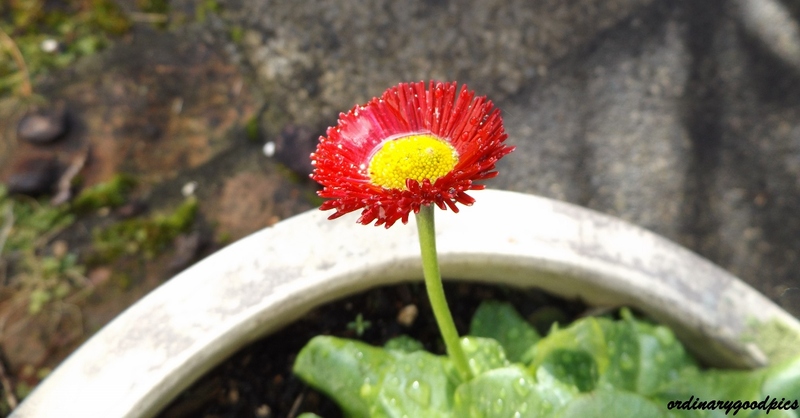 We have a lot more winter ahead of us yet but nature is giving us a glimpse of spring in the neighbour’s garden. 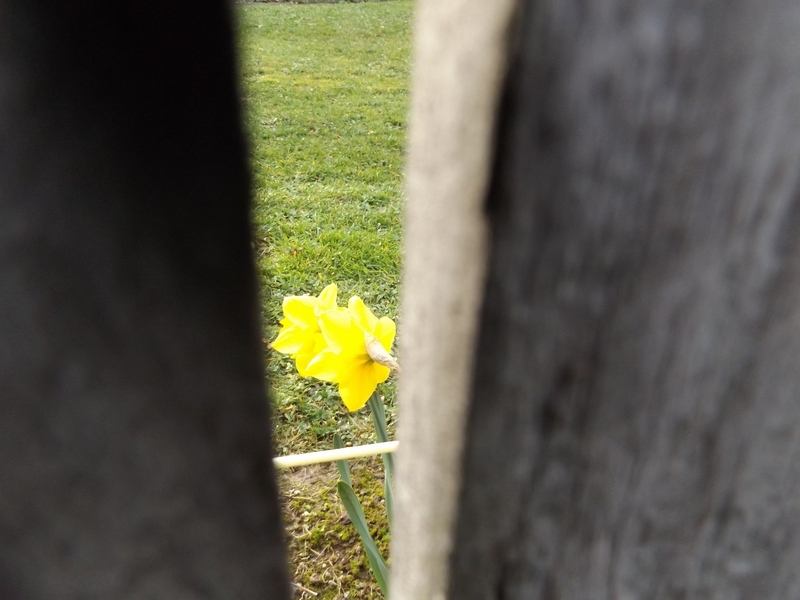 This entry was posted in Uncategorized and tagged Beauty, daffodils, gardens, nature, spring bulbs, spring flowers on July 27, 2015 by ordinarygood. This entry was posted in Uncategorized and tagged Beauty, flower, gardens, macro photography, nature, photography, raindrops on July 19, 2015 by ordinarygood. 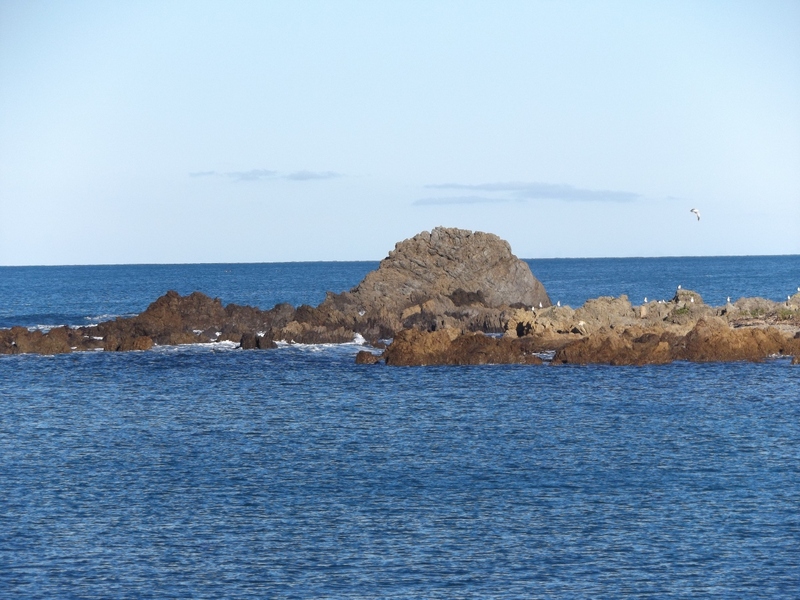 Not far from my home on the West Coast of the North Island, New Zealand, there is more wild coastline. 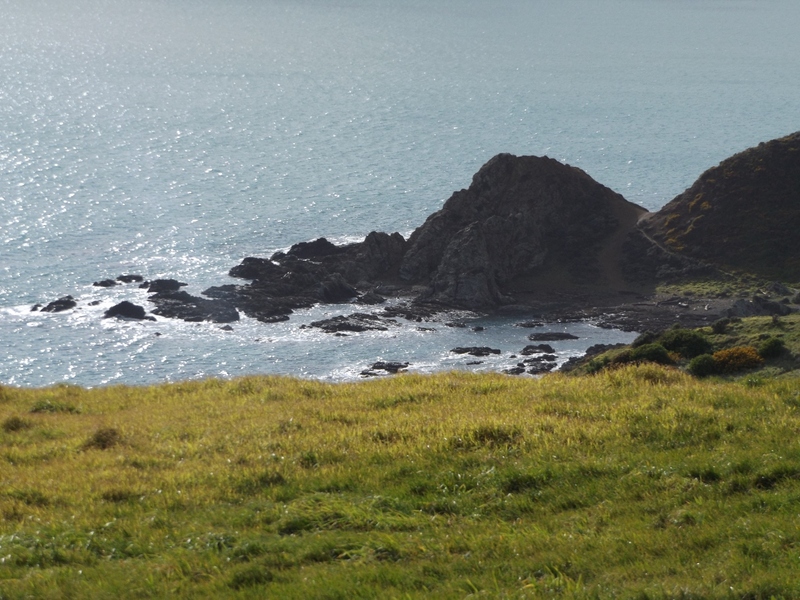 Views from above this coastline can be gained from Whitireia Park, a reserve area which some years ago was farmed. Standing on the high cliffs in the park there is almost always a wind blowing across this exposed site. It is bracing and exhilarating. 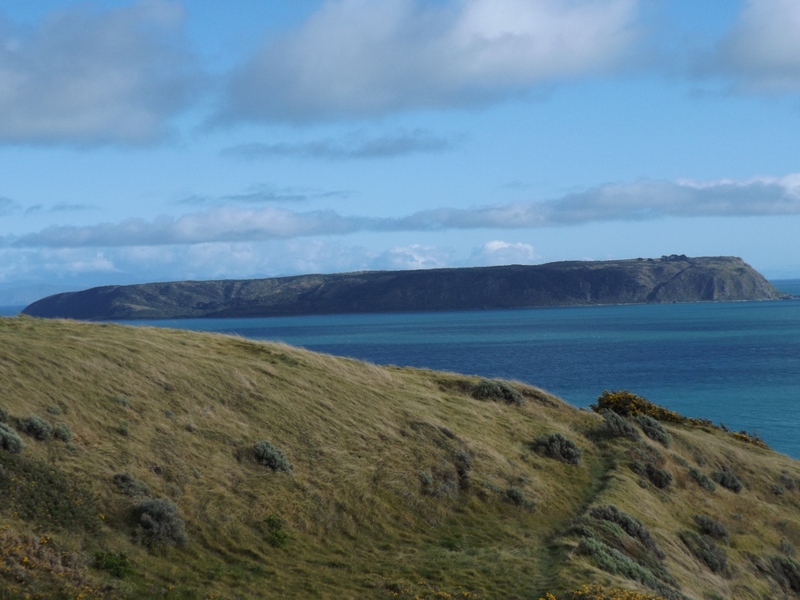 This high vantage point offers great views of Mana Island, a wildlife sanctuary. 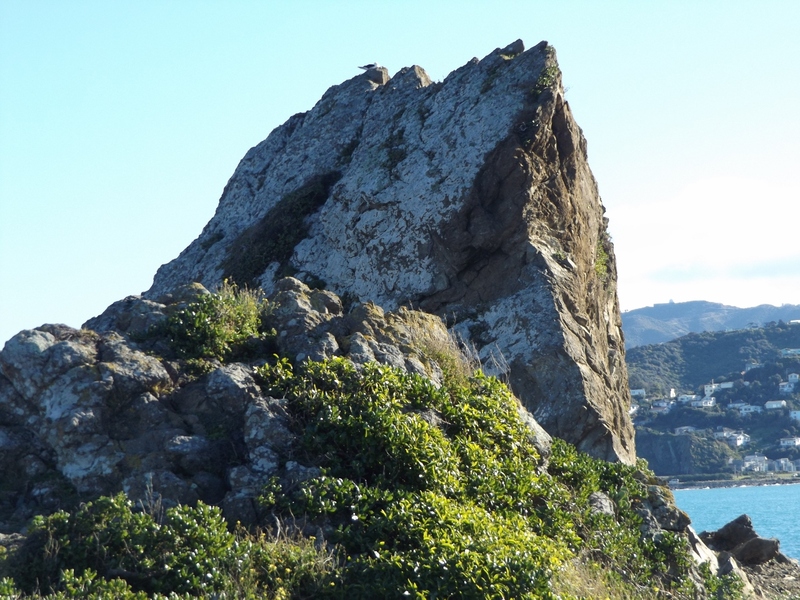 The rocks are rugged and treacherous here as the Tasman Sea washes into the Porirua harbour entrance. People use this stretch of coast and this park for all manner of recreational pursuits, both in the sea and on the land. My visit was to record more of the beautiful landscapes that are found in the area in which I am fortunate enough to live. This entry was posted in Uncategorized and tagged beaches, Beauty, cliffs, coastline, landscape, Mana Island, nature, New Zealand, North Island New Zealand, photography, Porirua, Porirua Harbour, recreation, rocks, sea, Tasman Sea, West Coast, Whitireia Park, wildlife sanctuary on July 17, 2015 by ordinarygood. This entry was posted in Uncategorized and tagged Moa Point, photography, rocks, Wellington, Wellington's South Coast, Winter on July 15, 2015 by ordinarygood. 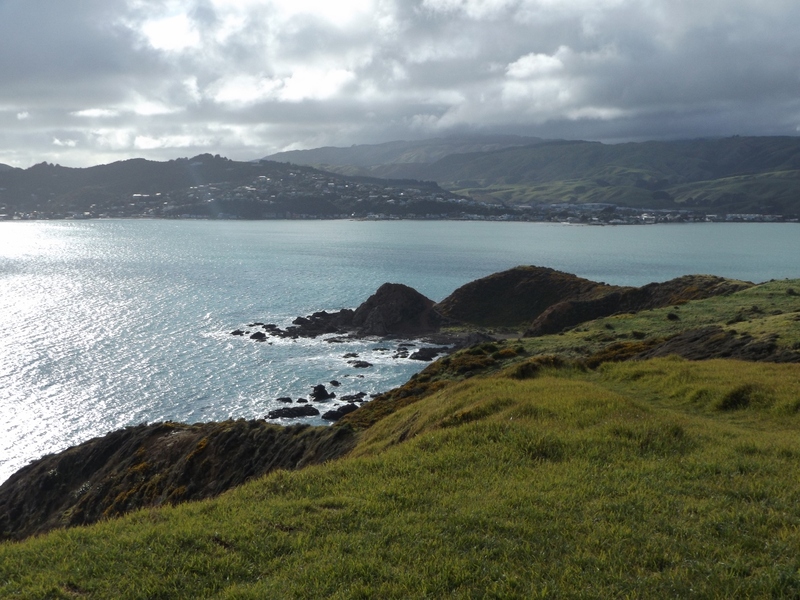 A break in the weather meant a jaunt down to the South Coast of Wellington. It was a stunning day but any breeze that was blowing was still bitterly cold. Our climate can be harsh here so any day when the sky is clear blue, the wind low and the sun shining brightly is a day to get out and about. It has been a long time since we visited this wild, wind-swept and often stormy stretch of coastline. When the southerlies pound in the sea is an extreme and dangerous force. 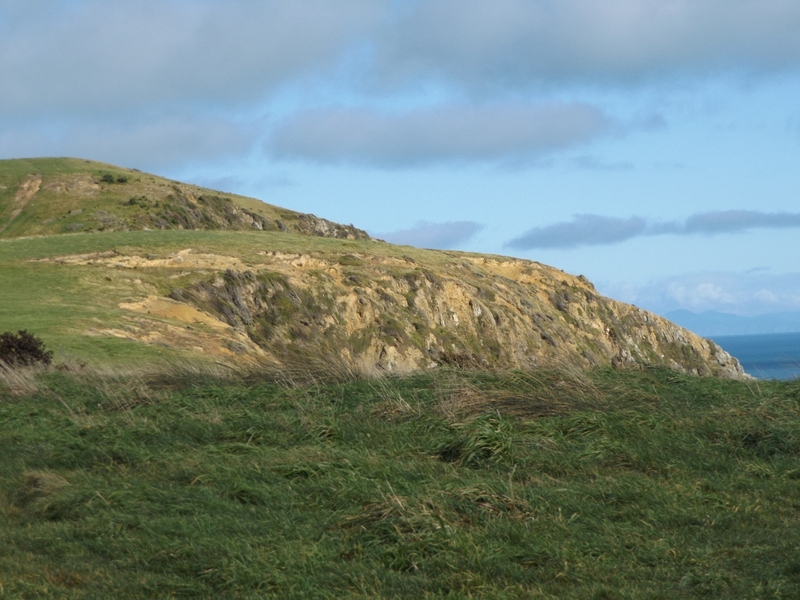 It is also near the entrance to the Wellington Harbour and around the road to the west is the runway for the airport. 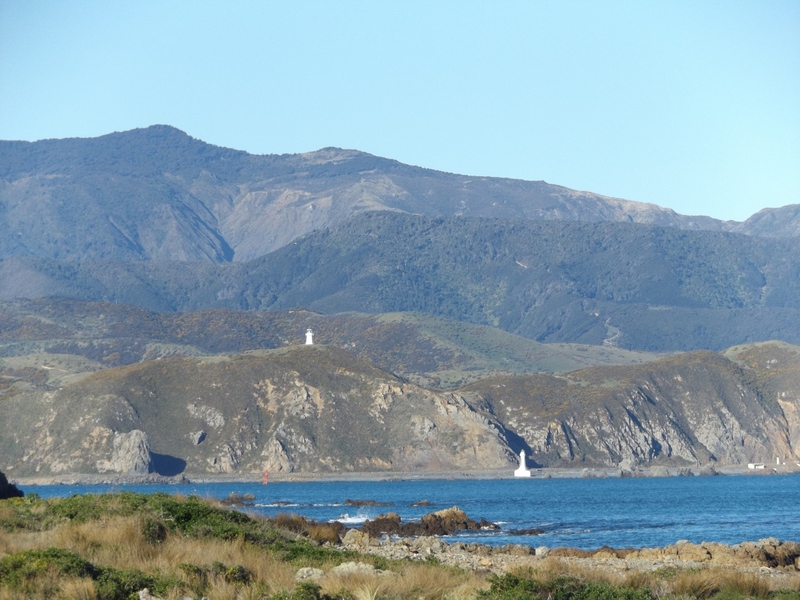 Across the Wellington Heads the land is no less rugged or any more hospitable. 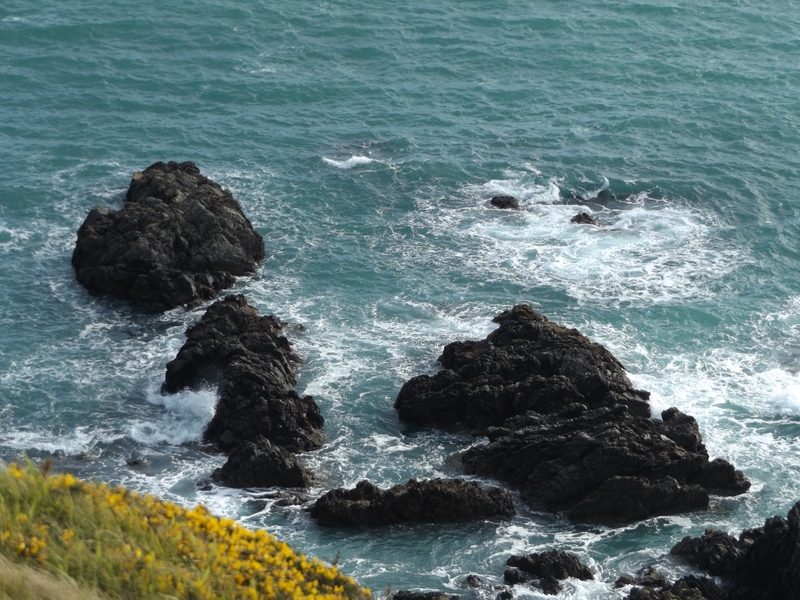 The channel into the harbour has many jagged rocks and reefs so navigation is done very carefully, often with a locally based Pilot to steer foreign ships safely into the harbour. 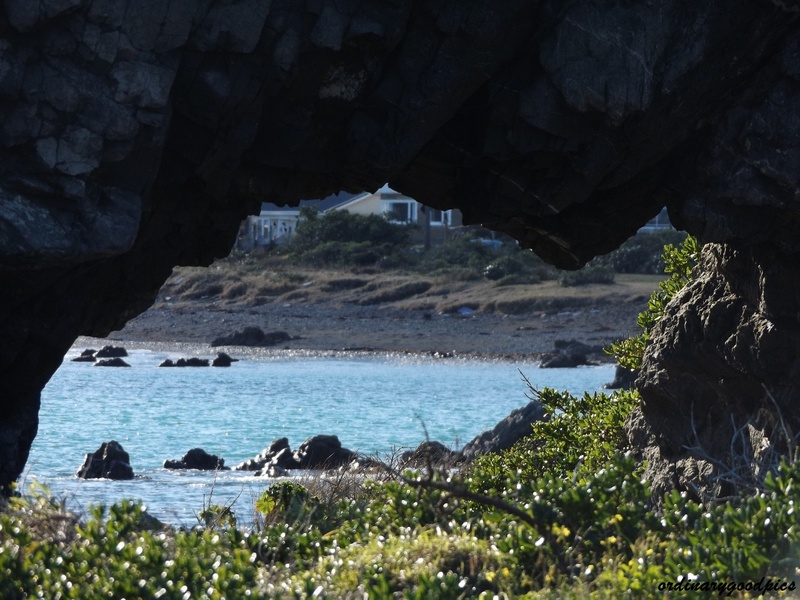 There are no safe swimming beaches but plenty of rocks to climb and explore. Diving is a popular past time for the people brave enough to go into the icy waters. 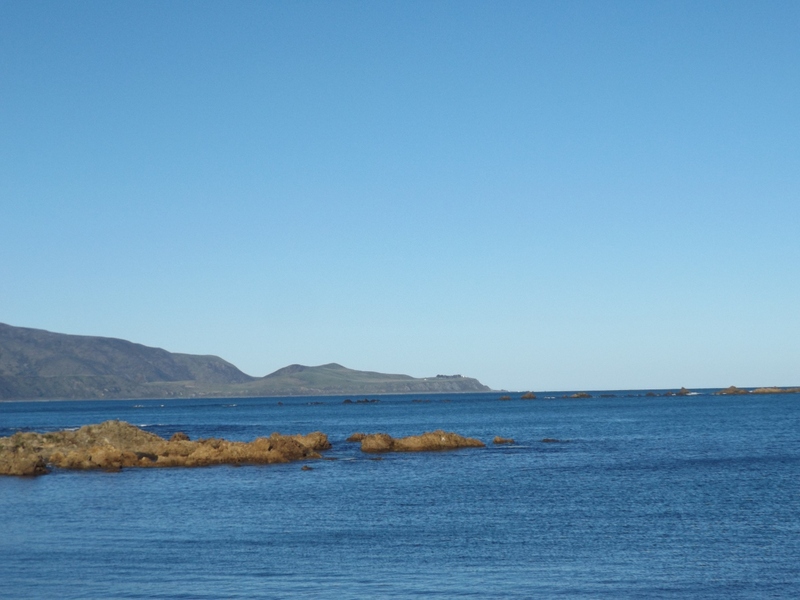 The sea here is a mix of Cook Strait (that divides the two main islands of New Zealand) and the Pacific Ocean. 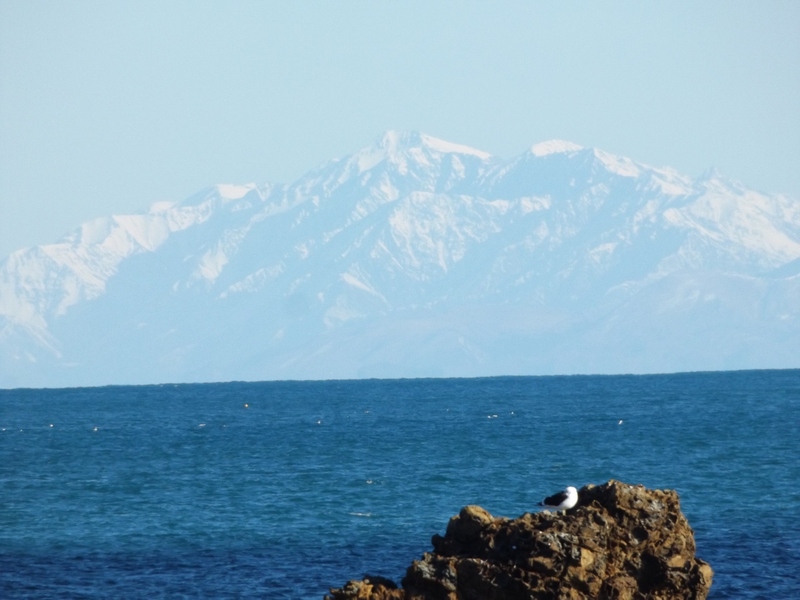 Sadly the high, snow-laden Kaikoura mountains at the northern part of the South Island were hazy but they help explain why the air is so very, very cold at the moment. 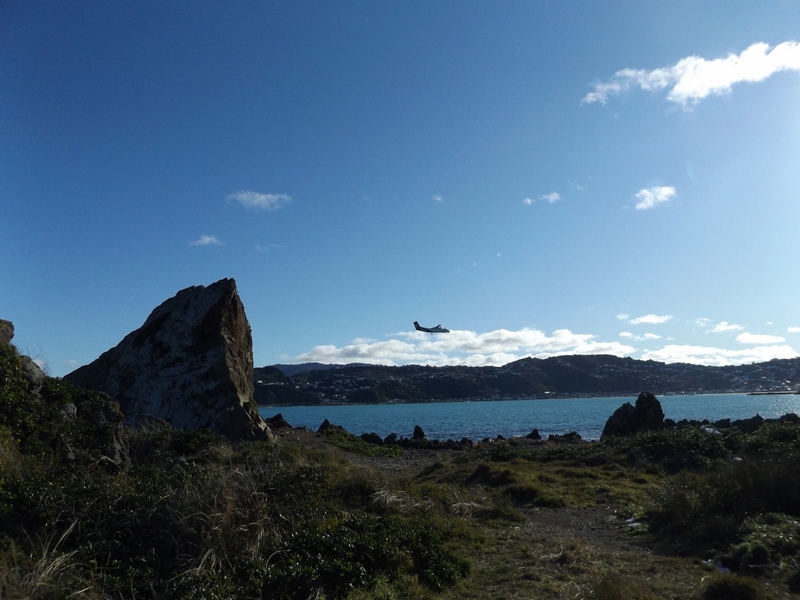 and of this aeroplane coming in to land at the airport, we headed to a popular café in nearby Lyall Bay to enjoy a hot drink. From the footpath near the café the view goes back to the airport and beyond that the beach we had just stopped at to take the photos. 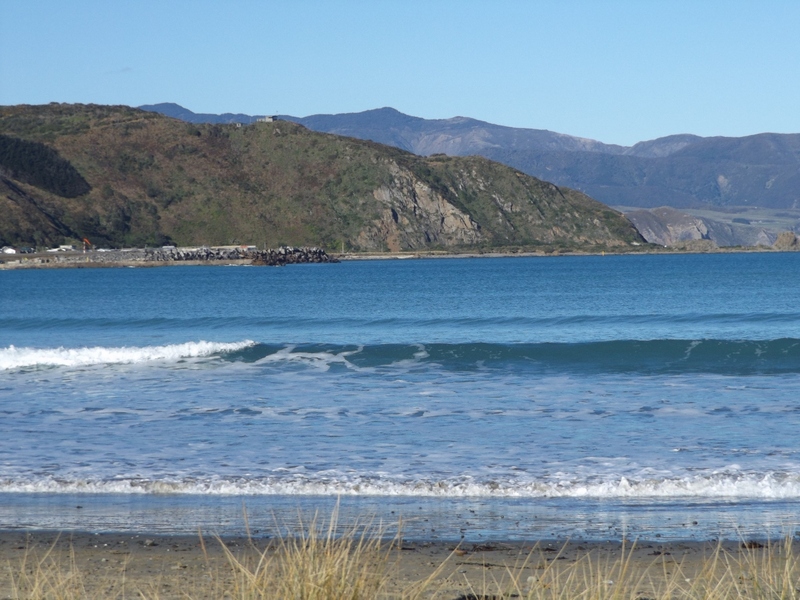 In contrast this is a sandy beach and people surf and swim here although the water is never particularly warm. Bracing and beautiful summed up the experience. 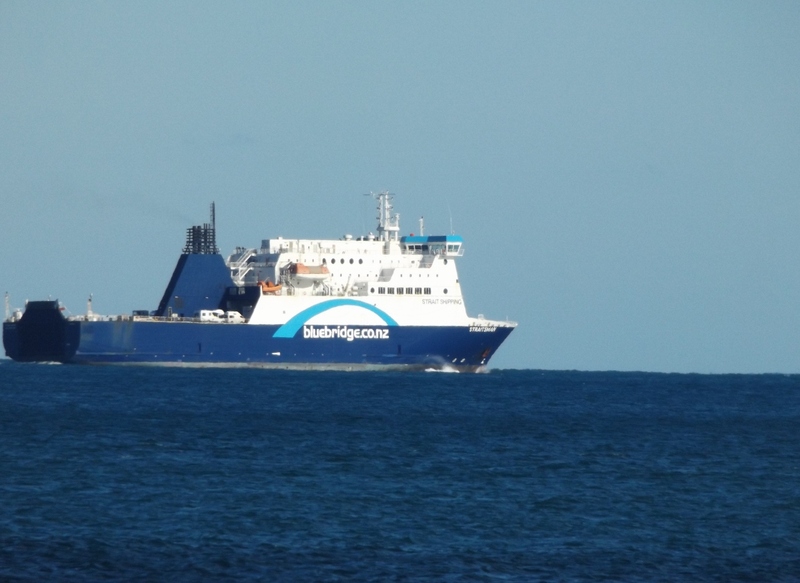 This entry was posted in Uncategorized and tagged airport, animals, beaches, Bluebridge Ferry, Cook Strait, diving, Kaikoura Mountains, Lyall Bay, nature, Pacific Ocean, photography, rocks, surfing, swimming, waves, weather, Wellington Harbour, Wellington South Coast. Wellington Heads, winter's day on July 14, 2015 by ordinarygood.